Learn the Stryker Omega Dynamic Hip Screw for extra-capsular neck of femur fracture surgical technique with step by step instructions on OrthOracle. 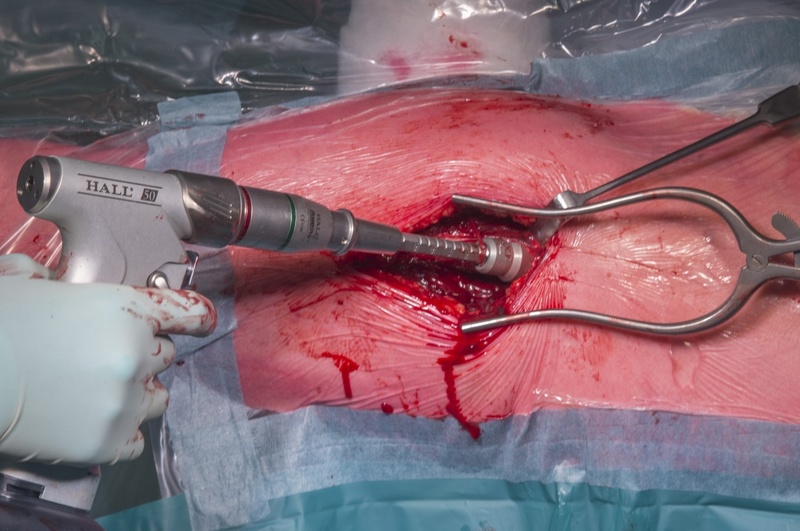 Our e-learning platform contains high resolution images and a certified CME of the Stryker Omega Dynamic Hip Screw for extra-capsular neck of femur fracture surgical procedure. “It’s just a DHS”! is something I have heard many times from consultant colleagues through to junior trainees alike. It is never “just a DHS”. In my opinion these operations can be difficult, fracture reduction may be challenging, maintaining reduction whilst performing the operation can catch out the unwary and malpositioning of implants can lead to failure. Additionally constructing the kit used for surgery (especially if an unsupervised junior nurse is present) is often overlooked. Neck of femur fractures for the most part are in frail, elderly patients with osteoporosis and significant comorbidities. Getting it right first time is paramount. The following operation is a fixation of an extra-capsular neck of femur fracture using a Stryker Omega Dynamic Hip Screw (or sliding hip screw). I have taken some additional slides outside of the operation to show you how to construct and use the Stryker DHS set. Each company’s system is slightly different and I would strongly encourage the reader to review the op-tech before embarking on any surgery, especially as the supervisor may think this is just a DHS!